It all began in 2007 when Thank Dog! Training, Southern California’s leading dog obedience training company, was introduced to Barry’s Bootcamp. Jill worked out there every morning for an entire year, losing 40 lbs., and Jamie enlisted for a few months to quickly get back into shape and train at her own gym.They loved the workout- it was like having an exercise coach and teammates for the success of everyone’s physical well-being. The motivation was easy to keep and the focus was never lost. It was the perfect solution for anyone looking to live a more healthy and active lifestyle, while meeting others who were doing the same. One quiet day over lunch, Jill and Jamie began to talk about Barry’s Bootcamp, exercise, and how they wished their dogs could go to the gym to exercise too. After all, lack of exercise is the #1 cause of dog behavioral problems and unfortunately, with busy schedules, sometimes it doesn’t get fit in for the day. And that’s when the light bulb turned on and Thank Dog! Bootcamp became an idea. They worked diligently as a team, making their idea come to life and building a business that once seemed impossible. In 2009, Noelle Blessey, a personal trainer and bootcamp instructor joined Jamie and Jill in their endeavor. When Jamie left to teach Transcendental meditation to inner city school kids in San Fransico (we think that’s pretty cool! ), Noelle stepped up to the plate and joined the partnership. Since then, Jill and Noelle have thrived in the business and have managed to create a program that can’t be beat…not even duplicated (it’s not as simple as just working out and telling your dog to sit, you’ll see). 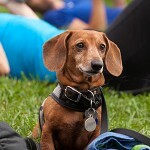 Welcome to the first ever obedience and fitness program for dogs and their people! This is where you’ll get the MOST out of training. Thank Dog! Bootcamp’s mission is to transform the lives of people and their dogs by providing a unique and challenging, yet fun fitness program that combines body workouts and dog obedience for the healthy success of both man and his best friend. Our certified dog and physical fitness trainers are dedicated to motivate, inspire, and support all participants striving to be the leader in not only their own lives, but in their dogs’ lives too.